1 ) Sokoban level editors at Sokoban2. And some solver programs support level editor too. 4 ) Tackle complex puzzles with LP Sokoban# It merely shows a puzzle and processes the user's moves while he attempts to solve the puzzle by Luc PATTYN. At web page you can find the source code and files. 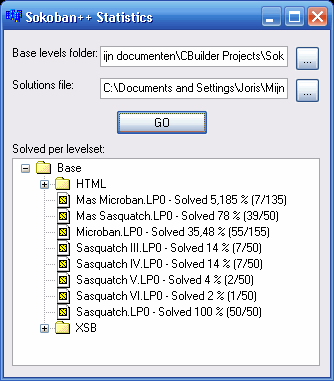 5 ) LevelManager.exe : SokoMind Level Manager by Gerald HOLLER. 6 ) SokoXform by George PETROV transform Sokoban levels by rotating and/or flipping them. 8 ) Solution Rotator to change UDLR strings for rotated/flipped levels. 1 - Remove all the unreachable walls, boxes, etc. 2 - Distinguish reachable and unreachable spaces, they are denoted by "-" and "_" respectively after normalization. 3 - Add corner walls if needed. The input level should be in XSB format. The normalizer supports input level using "-", "_" or " " for spaces, or any combination of them. The output normalized level will always use only "-" and "_" for spaces. 10 ) Sokoban Level Analyser - English (or French) by François MARQUES's online web page. This program is also online at my Sokoban 6 page. Note : The original code at Mr. François's web page this utility with rotating levels and solutions but i can't put it with them. 12 ) Sokotrim.html HTML online program by Sven EGEVAD is a utilty program "Generates a Sokoban map" for a given solution. Also a new solution, with fewer moves, will appear in a lower textbox. And you can flip both level and solution at same time horizontal or vertical or clockwise. 14 ) XhtXsb.exe by Evgeny GRIGORIEV (GRIGoRusha). Xsb-level from Xht-solution Restorer (all). 15 ) SokoDUP by George PETROV is a utility program for Sokoban levels (no user interface, start from dos prompt). It checks for equal levels in collections and inside them. 17 ) HexoDUP by George PETROV is a utility program for Hexoban levels (no user interface, start from dos prompt). 18 ) Nsk3dup.exe by T T K Tse Shum FAT. is a utility program for Sokoban levels. Download TSE Sokoban v1.1.6 with Nsk3dup.exe from here. 19 ) Duplicate Finder in Sokoban YASC isn't located in the "Tools" window, even though that clearly is the natural place to put it. 20 ) All_Xsb1.bat (62Byte) & Add_file.bat (155Byte) (these 2 bat files in all_xsb.zip file) by George PETROV. Put all separate Sokoban level's XSB files in one text file. Web page. - Download from here. 21 ) Tse's Sokoban for Windows v1.1.6 by T T K Tse Shum FAT at his game there is an util (without any extra exe file). You can display a txt file which includes more than one xsb and Tse's Sokoban seperate one by one xsb files. (You can find all the seperated xsbs at "C:\Program Files\Tse's SokoBan\Mazes\(your txt file name)\". If you install setup program at "C:/". But at the result the xsb's have ***.1 , ***.2 , ... and you must change all them to xsb. Download TSE Sokoban v1.1.6 from here. 22 ) SokoSplit is a command-line utlitity for extracting puzzles from a single-file puzzle collection into individual files suitable for use with SokoSave. It does an especially smart job of determining which additional information (puzzle title, description, author, etc.) belongs with each puzzle. SokoSplit works equally well with Sokoban, Hexoban, and Trioban puzzle collections. 23 ) Hexoban_Editor_VK.exe by Victor KINDERMANS from Belgium is a utilty Sokoban (xsb) level to Hexoban (hsb) level converter contain too. 372kB - Download from here. 24 ) DatTxt.exe by Evgeny GRIGORIEV (GRIGoRusha). Till 22.06.2005 - This utility is removed under the request MIC, and you must get permission from author. 25 ) RdfTxt.exe by Evgeny GRIGORIEV (GRIGoRusha). Converter files from format rdf (WinSoko) to files in format Txt (all). 25kB Download at his "My Util" web page. - Download from here. Till 22.06.05 - This utility is removed under the request MIC, and you must get permission from author. 28 ) MovLURD.exe(xsb,xht) by Evgeny GRIGORIEV (GRIGoRusha). 29 ) XsbTxt.exe by Evgeny GRIGORIEV (GRIGoRusha). Copy all files in format Xsb (all) to one file in format Txt (all). 20kB Download at his "My Util" web page. - Download from here. 30 ) SokoConverter by Juan Carlos URIARTE from Argentina is a html page converts XSB to RLE, LURD to RLE, RLE to XSB and RLE to LURD. 32 ) YSokoban v1.91 is the first one in giving to the users complete support for import and export: XSB or LURD with RLE by George PETROV. This is an option for the soko-users who are those that adopt in definitive, to the soko-program that better adapts to their necessities. 33 ) As an interesting historical note, SokoSave by Eric SUNSHINE & Paul MCCARTHY supported RLE compression for its saved-game files since its creation in 1994. In the saved-game file, RLE compression was applied both to the puzzle board and to the LuRD solution. Saving in this format was dropped in January 2002 because it was non-standard (and thus non-portable), although even the latest version of SokoSave is still able to read those old saved-game files. Those who are curious can find a description of the RLE compression in the FILE_SYNTAX.txt file which accompanies SokoSave. The RLE compression is described near the bottom of the file. 34 ) Visual Sokoban level converter : Translate the coding for the levels into normal ascii is "C=3 D=4.... so D# is ####! is meaning line break". You can use Sokoban++ to open the database.pak file. Then you can save it as a normal xsb text file. By the way: Sokoban++ can also be used to open LP0, RDF, and various other file formats in this way. Getting from YahooGroup mails Sokoban++ author Joris WIT. 36 ) ROOMS.DAT for WinSoko is in RDF format. 1. Make a copy of ROOMS.DAT. 2. Rename the copy to ROOMS.RDF. 4. Optionally, combine the individual ROOMSx.TXT files into a single ROOMS.TXT file and rename it to ROOMS.XSB. Incidentally, you appear to be using an old version of WinSoko. The latest version is 2.22.3 and uses the filename ROOMSOK.RDF for thelevels. From version 2.08, many levels were omitted unless the author was able to obtain written permission to use them. You can reconstruct the missing levels by cutting and pasting between the old ROOMS.DAT and the new ROOMSOK.RDF. Getting from Yahoo mails Garry FRANCIS - Gazza. 37 ) BoxWorld Level extractor to extract the levels from the BoxWorld game (100 levels). This program makes it a xsokoban format textfile. Run this program from the command prompt. Getting from Sokoban++ writer Joris WIT's Sokoban junkyard web page. - Download from here. 42 ) DHTML Sokoban Service Pack 1 the DHTML Sokoban game as well as the Level Designer HTA - By Rajeev HARIHARAN. Download DHTML Sokoban from here. This only works on Windows 2000 / XP. Getting from Sokoban++ writer Joris WIT's Sokoban junkyard web page. 46 ) Sokoban Replayer by Yang Chao is a Java Applet for showing animation of solutions of Sokoban levels. The applet is configurable. You can specify the level solution (in LURD format), skin and animation speed for the applet. SokoReplayer also supports the RLE levels and RLE solutions generated by YSokoban (using Ctrl-Shift-L). For the speed, the smaller the value, the faster the applet replays. 47 ) Sokoban Website Generator 1.0 Use this utility to generate a HTML page like this or this. Run this program from the command prompt. 58 ) Sokoban TxCalc - Translated web page by Serg. Of course, given a sufficiently small level, so you can perform the necessary calculations. For more complex levels can cause serious problems. But that is very pleasant, even a "small" level is very interesting as a game. You can try to resolve it and make sure that this is not easy. For programmers can formulate two non-trivial task for search algorithm for solving a given level and/or develop a generator game levels. Details on the program presented on a separate page, as, indeed, on sokobanu. 59 ) Sokoban SG Optimizer has position tree optimizer/analyzer, solution development/error correction/analysis, multiple-level solution manager/importer, solution five indicator support, jump drive runtime support/live for Linux OS, and complete French language support. Yahoo Groups File's Fonts for XSB files, for Sokoban. Crate Keeper- 2 by Doren & Rainer is a skin for Sokoban for Windows. Sokoban++ Skins with more than 55 skins ! Sokoban for Windows Skins with more than 35 skins ! YSokoban Skins with more than 50 skins ! My intent is "i will glad when our kids love Sokoban and thinking" like us. The sources of pictures : Icons Mysitemyway is free here. The sources of pictures : 1 Rainbow paint from web. The sources of pictures from web. The sources of pictures from web, you can find lots of funny (but brainy) anectodes for Nasreddin Hodja about every language in web. The other guy called Keloglan -BalgBoy (in this skin Sokoban) is a clever boy with lots of tales too. For more information about Nasreddin Hoca please visit Wikipedia, the free encyclopedia; for also Keloglan at Wikipedia. The sources of pictures from web. The Rescue Man "Evren Soyucok" is from AKUT (Search & Rescue Association) from Turkey. And the target picture getting from Canakkale city earthquake photo in Turkey. About earthquake i made a web page named "deprem" (same with earthquake) at : www.erimsever.com/deprem.htm. I dedicate this "deprem" web page to my dauther "Beste Sever". "SpongeBob SquarePants" all rights reserved (Here for only personal non-commercial use). The sources of pictures from web. For more information about SpongeBob SquarePants please visit Wikipedia, the free encyclopedia. "Wile E. Coyote and Road Runner" all rights reserved (Here for only personal non-commercial use). The sources of pictures from web. For more information about Wile E. Coyote and Road Runner please visit Wikipedia, the free encyclopedia. "Alaaddin" all rights reserved (Here for only personal non-commercial use). The sources of pictures from web. For more information about Alaaddin please visit Wikipedia, the free encyclopedia. "Winx" all rights reserved (Here for only personal non-commercial use). The sources of pictures from web. For more information about Winx please visit Wikipedia, the free encyclopedia. "Mermaid Melody" all rights reserved (Here for only personal non-commercial use). The sources of pictures from web. For more information about Mermaid Melody Pichi Pichi Pitch please visit Wikipedia, the free encyclopedia. "Mario" all rights reserved (Here for only personal non-commercial use). "Wall-e & Eva" all rights reserved (Here for only personal non-commercial use). "Nemo (Finding Nemo)" all rights reserved (Here for only personal non-commercial use). The sources of pictures : Sokoban=Nemo with resolution 2560x1600 & 1440x900 (but i love this version), Box=Black Pearl (i used the winner), Target=Shell is free here. For more information about Finding Nemo please visit Wikipedia, the free encyclopedia. "Leonardo Da Vinci" all rights reserved (Here for only personal non-commercial use). The sources of pictures from web. For more information about Leonardo Da Vinci please visit Wikipedia, the free encyclopedia. 1. Square tiles - 419x419 : Your original version is 419x421. YASC can work with non-square tiles, but it cannot "guess" the tile-size when all 7 tiles are arranged in a single image like the version attached to this mail. 2. Black grid line changed to "almost" black : The skin has a black grid line, RGB(0,0,0). It has been changed to RGB(20,20,20) which visually is so dark that it still looks completely black on the screen, but it helps programs like YASC which somewhere in the pipeline from raw skin image to scaled and masked image appearing on the screen uses "black" to signal "transparent pixels". ... I would really appreciate it, if you make these 2 important modifications in your official version. These skins are in Sokoban++ format, which Sokoban YASC can import directly. Otherwise, the program cannot separate the object from the background, something which is important for programs like Sokoban YASC with a high-quality smooth animation. YASC supports both drawing methods, but for the 7-images-non- scripted skin-format used for these skins, the convention happens to be that YASC expects the objects to be drawn on top of an exact copy of the background. That explains why the animation doesn't work for two of these skins: "Golf" (fixed) and "JellyBlueGreen". These kind of programs find/detect dead links in web site(s) for an automatic dead link detection tool ! For example :Web page link validator by Rel Software. Shareware, 30 days trial with evaluation version for 500 links. Very thanks "Jack Duthen" for give this idea with teaching.